I remember that conversation, and I still think it's a good fit. Anderson, though, didn't seem to me to approach the ordinary with the same methods , time and again; he was too much of a naturalist. Robert Altman would be a good film comparison. Auster, with a wonderful surface style, is more a formalist, like Brian dePalm as a director showing off his Hitchcock moves each chance out. I think, though, Auster will write more good books, maybe brilliant ones. I just wish he wouldn't publish every damn thing that comes from his keyboard. Actually, I've come to believe that if Sherwood Anderson reincarnated, it was as Raymond Carver. The same dreaminess and underlying sense of mercy is there, even if Carver is more quizzical in a modern smart-guy way. What say you? Anderson could play more notes on his instrument than could Carver, I think. The late RC made me think of someone who was trying to be chintzier with his qualifiers than Hemingway. That leaves him with a limited range to express mood and emotion--the muted tone of Carver's stories is singularly without joy. Depression and utility closet despair seem the only emotions he knew intimately and he didn't seem interested in trying anything different. 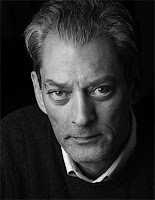 Auster is an inconsistent novelist, but one does have to credit him with attempting methods other than those he's best known for, especially in the books "Mr.Vertigo", written in an interesting 20's Americana vernacular, or in "Timbuktu", which tells a story from a dog's point of view when the creature realizes his master is dying and that he must find a new one. Sherwood Anderson wasn't a brilliant stylist, having a manner that was closer to Sinclair Lewis than William Faulkner,but he did have great sympathy for his characters, a diverse lot that occupied Winesburg, Ohio. Although is style lacked elegance , it had finess, and his ability fully imagine the experience of fictional characters unlike him gives credence, I think, to the claim that his story collection is "An American 'Dubliners"".